2. Thoroughly cream shortening and sugar. 3. Add egg, milk, vanilla, and almond extract; beat well. 4. Stir together flour and baking powder; gradually add to creamed mixture, mixing to make a smooth dough. Do not chill. 5. Shape Wilton triangle parchment paper into cone shape and insert tip Wilton 1E. Place dough into cone and pipe onto slightly greased cookie sheet 2 inches apart. 6. Bake at 400° 6 to 8 minutes; remove cookies from sheet; cool on rack. 7. Makes about 3 – 4 dozen cookies. Other blog postings with similar recipe of Spritz Cookies. 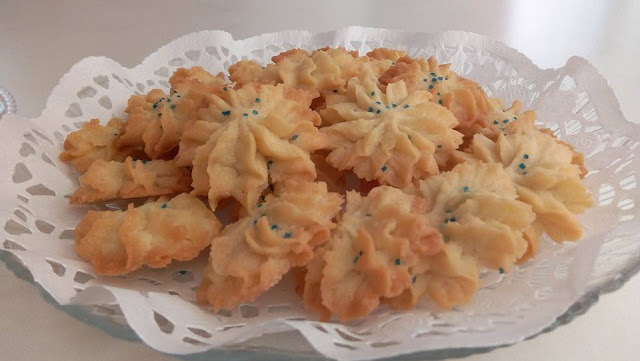 Spritzgebäck is a type of German and Alsatian-Mosellan Christmas biscuit or Christmas cookie made of flour, butter, sugar and eggs. 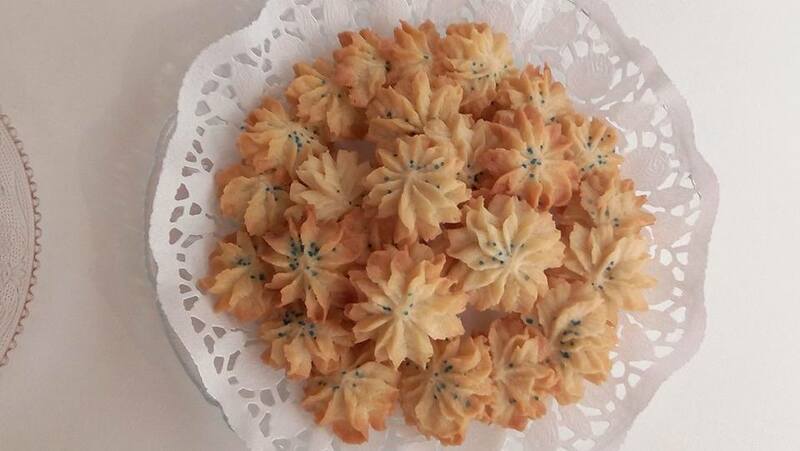 When made correctly, the cookies are crisp, fragile, somewhat dry, and buttery. The German verb spritzen means to squirt in English. 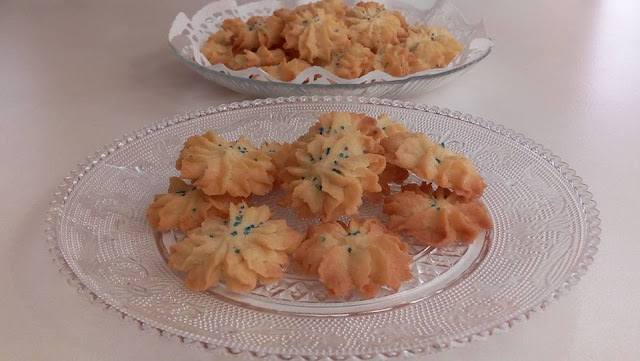 As the name implies, these cookies are made by extruding, or "squirting," the dough with a press fitted with patterned holes (a cookie press) or with a cake decorator, or pastry bag, to which a variety of nozzles may be fitted. 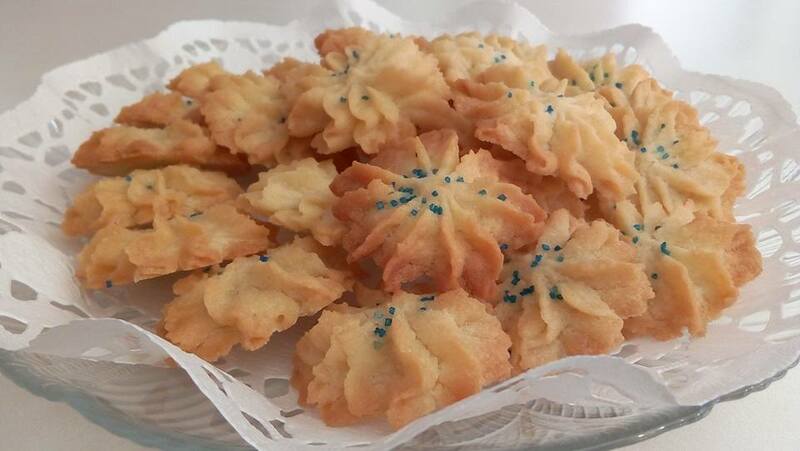 In the United States, the name Spritzgebäck is often shortened to spritzbecoming known as the spritz cookie. 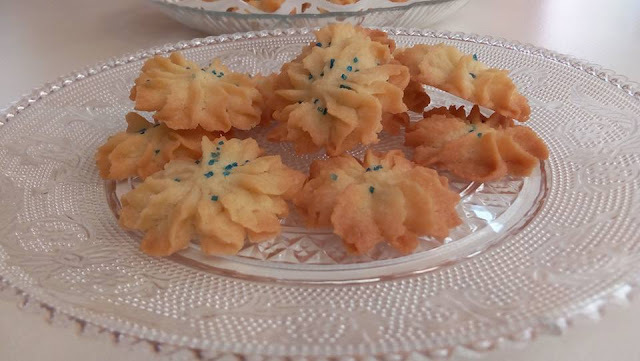 Spritzgebäck is a common pastry in Germany and served often during Christmas season, when parents commonly spend afternoons baking with their children for one or two weeks. Traditionally, parents bake Spritzgebäck using their own special recipes, which they pass down to their children.